Sliders. Knobs. Checkboxes. Such is the spread-sheet roots of strategy games. Let's fix that. 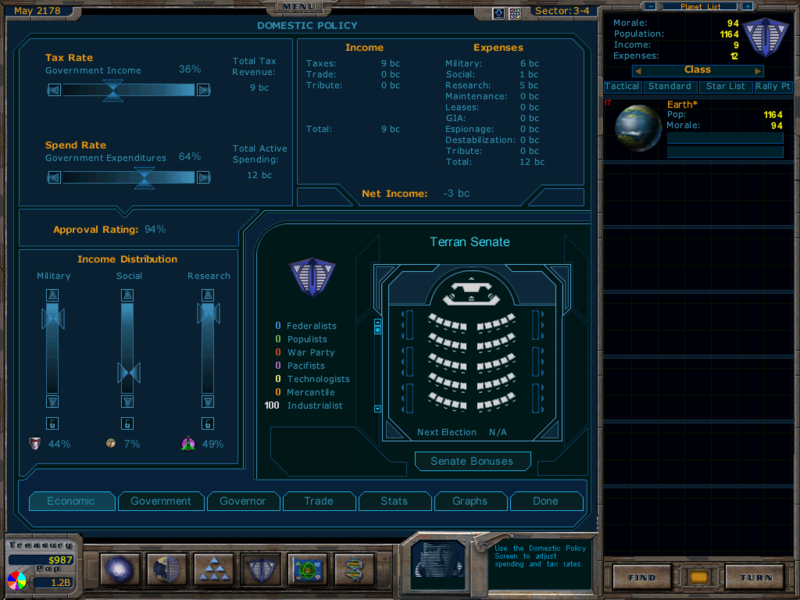 In Galactic Civilizations I, you would set your tax rate. Your tax rate affected the approval rate on your planets. You could then decide how much of your GDP the government would take control of with the spending slider. 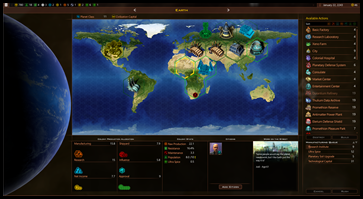 From there, players would direct their civilization's output between Military, Social, and Research. 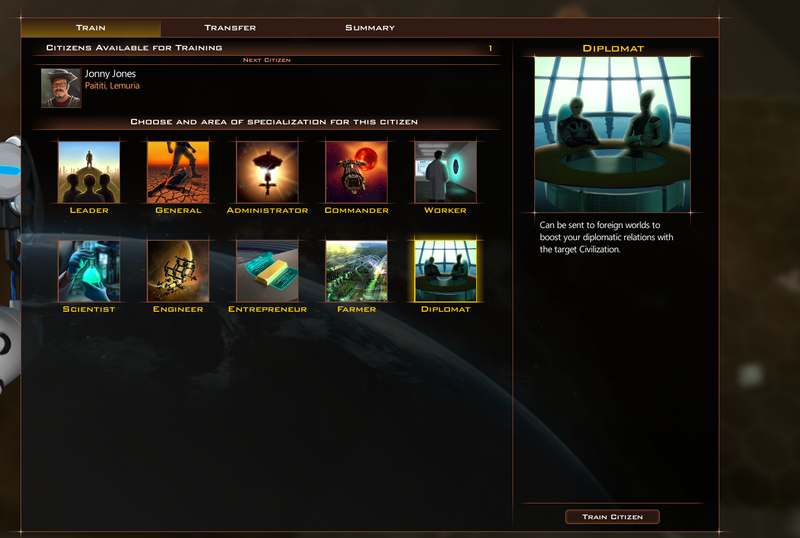 In Galactic Civilizations III, we had changed it to the Production Wheel: Manufacturing, Wealth Generation, Research. I actually don't have a problem with sliders to be honest. But they have a serious user interface limitation: The more sliders you have, the more confusing the screen and the more difficult it is to communicate the results. Our economies are a lot more complicated than Money making, Research and Planet manufacturing and Fleet construction. Obvious real-world examples would include food production, consumer goods, social programs and international affairs. In a space game, there are even priorities you might have: Mining, espionage, soldiers, Precursor archeology, and so on. Imagine all that as sliders. Oye. Across your entire civilization, an individual of great potential will rise up and join your government. When this happens you decide an area for he or she to specialize in. A new citizen has joined you. What will you do with them? Now, there are some...provisos here that will make each game play a bit differently. How often you get a free citizen is not dependent on the size of your civilization. It is, by default, one citizen every 10 turns. So each citizen is pretty important. A 200 turn game will leave you with 20 natural citizens. Use them wisely. The areas of specialization are based on what technology you have. 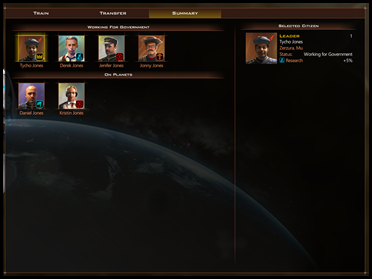 At the start of the game, if you are playing as the Terran Alliance, your options are a Leader or a Commander. You can choose to keep them safe in your capital providing a global bonus (great for large empires) or you can send them to a specific planet to really boost that planet's production in a given area (great for small empires) but also makes them vulnerable if they are assassinated or the planet is invaded (once they settle, they're not leaving). They level up over time. Thus, the order in which you specialize them matters. The govern screen with some citizens there. Leaders act as wild cards and can be placed in any category. Citizens can also be sent to planets to greatly boost it in a specific area. Citizens can't teleport. When sent to a planet, a VIP transport takes them from your capital world to the planet in question. Worried about micro-management? Don't. We also include easy ways to move citizens from your capital to your empire if necessary. Not just icons. Each citizen has a name and where they're from and a picture (and yea, we do this for all 12 races, Drengin females...you do not want to attend their march). Provides 3% boost to target civilization priority. Can be moved around to any priority category. Reduces target planet’s maintenance by 25%. Increases administration resource by 1 plus 10%. Improves global planetary resistance by 3%. 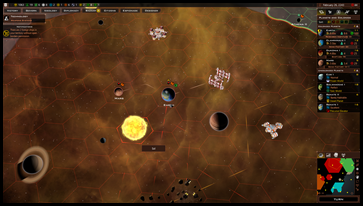 Provides 5 legions to target planet for defense. Can be converted into an invasion transport holding the General and his legions. Increases planetary defense of orbiting ships by 25%. Can be converted to a Flag Ship that is added to a target fleet to give it a combat boost. Can be sent to eliminate a spy on a planet. Can be assigned missions targeting foreign powers. Provides a global 3% bonus to planetary goods and services. Can settle on a planet providing a 25% boost to planetary goods and services. Provides a global 3% boost to influence. Can settle on a planet and boost that planet’s influence by 25%. 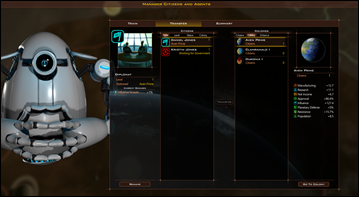 Can be converted into an Emissary and sent to a target civilization boosting your relations. If you're a Galactic Civilizations player you might be thinking "This is going to require a lot of changes to existing balance." And you would be right. Take a very close look at the screenshot below. Look at the top of the previous screenshot. Notice how many resources there are? Your citizens are your principle lever for deciding what matters (and what doesn't) in your civilization. But how you will likely use your citizens will change from game to game because of the new resource system and their connection to what improvements you can build, what planets you can colonize, what your starbases can and can't do. 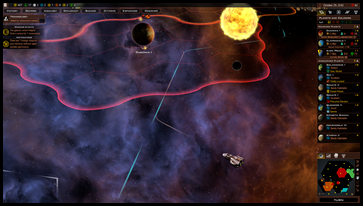 Resources accumulate (unlike in GalCiv III) and they result in a vibrant galaxy for your citizens to play in. So it turns out you're playing a heavily modded game that is near 100% the cause of your issues but you only mention it now after claiming the game to be broken. Wow that's really priceless. 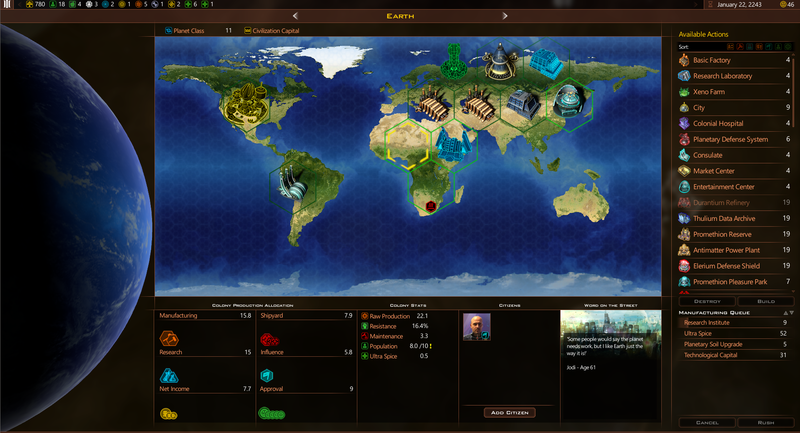 I'd wager the AI's aren't 44 techs ahead on turn 77 on gifted in an un-modded latest patch game. Why wouldn't you just ask for help in the modding section? lol ffs. Umm, if you are using a modded game it is pretty ridiculous to expect the devs to change their game to fix issues with your modded game. I mean seriously, your post now comes across as nothing more than a trolling post. Besides a mod is not the vanilla game. As gifted the Ai. is given economic bonuses. The problem here is not the game, but you are playing a level that the game has stated as having economic bonuses. Assuming you are using a stock faction, and not a customised faction. The Iconians, and every other vanilla faction has techs other vanilla factions don't have. If this is the case then the Iconian tech tree is doing all right with 44 techs no one else has. 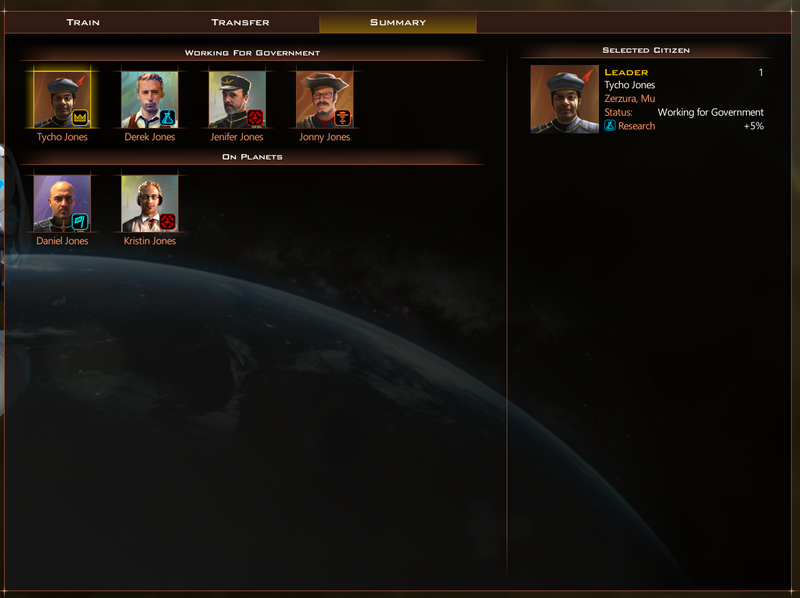 If you are playing more than the 12 vanilla factions upwards of a 100 factions there are probably redundancies with similar factions with the same tech trees. So in this case it is significant if you are playing a vanila, and if you are playing a custom faction. On a different note gifted provides a economic bonus. The research speed is significant here. If you are playing the fastest research then a research bonus caused by an economic bonus would be increased of research speed. On this note the problem is how the difficulty levels are done. I would like a harder Ai at higher levels, but instead the game gives economic bonuses to the Ai above normal this is not broken I just disagree with how they do this. It may not be possible to have harder levels above normal. I don't know. Your answer would require a entire redesign from how everyone programs Ai. I think it can be done. It's not broken. I just suggest a different way to program the Ai from what anyone has done. The modifications I made are part of global defines. They should be effecting all races equally. I do not see why these should have altered my progress relative to the AI's. The mods are the result of my dissatisfaction with the pacing options provided. I want a slower game, and I could not mod PacingDefs.xml to adjust game pacing with these values instead of it's flat +/- %'s. The values, other than Growth, were not enumerated for that .xml. I'm going to do a controlled test of Tech inflation today to see if it effects the player only, or both the player and the AI. My apologies to the author for getting this thread so far off topic, but since we're already here, here is where I'll post the results. ...My apologies to the author for getting this thread so far off topic, but since we're already here, here is where I'll post the results. Speed difference would only affect anything above normal, but my point is defeated if you are playing slowest. Awhile back someone who will remain nameless wasn't building factories and wondered why his world was undeveloped. The issue is probably something like that, or maybe the fact you don't care about adjacencies. Gifted does affect everything swith an economic bonus. This could be very significant, many of the leaders have a global bonus 3% and a local planetary bonus of 25% in their specialized field. I'm more interested in the local bonus. Hopefully each time they level up the percentage amount could go up. If they level up frequently perhaps each time you get a new leader those percentage amounts could be significant. e.g. 3% local bonus each new leader. After 20 leaders your first local bonus leader say a scientist would be 25 + (3 x 20) = 85%. A significant amount that would actually make specializing worlds in one area very worthwhile the bigger the bonus (e.g. 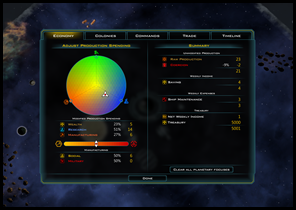 science planet mostly science buildings if scientist is there) which would allay my previous fears about permanent evenly split production rendering the adjacency bonus mechanic a limited consideration since you'd want to split between factories, research and wealth near equally. Assuming my previous assumptions have been correct in previous posts i.e. raw production/buildings haven't changed how they work and the leader bonuses take alter raw production and is e.g. not like another building. Would be nice to get some fine detail info from dev's on how things actually work also how moddable is it? I see that in the Planetary screen. What is interesting is it feels like we will have more micro per planet if wanted if not using global governors. Also note that we have a return of citizens giving quotes about the status of the Planet. This is a return from GCII, which lets the player see how the folks on that Planet feel, either about the empire or the planet itself. Nice spot! Totally missed that one. It was stated that food is now an empire resource, rather than just per planet. 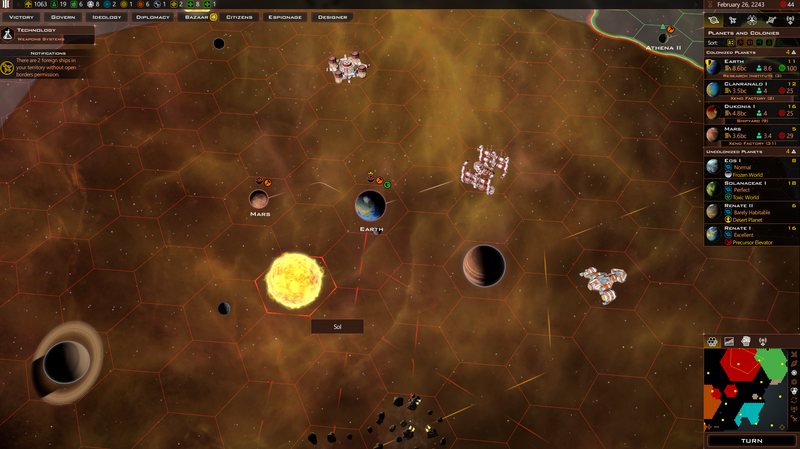 And a new improvement, cities, will determine the amount of pop per planet. So I does this mean we are changing how production is generated entirely? It means that we can no longer increase production based on boosting population at each planet by simply building a factory and 10 farms. I would think that is still the case but the increase is probably more gradual as each planet now contributes to the galaxy as a whole. Wow, reading all this new info is making my head spin with all its possibilities and showing me that I'm going to have to re-learn this game all over again. I do like the concepts being shown here a lot, though. Will be interesting to see how they all pan out in practice. Can't wait! wellin actuality production with out trade, or manufacturing was never that important. I still have a tough time differentiating between 'Manufacturing' and 'production'..From what I see is this..
Manufacturing is the value/force to build buildings on the planet. Raw production is a numerical value that is based on population. Production is the final value/force that is used to build stuff I guess, Ships to the Shipyard or Money from Econo buildings. I do not know how influence is calculated. I may be COMPLETELY wrong and I am happy to be corrected, other folks here probably know better than me. It does look like we are getting a complete revamp of how things are done on our game which is great! I thought raw production, and production is the same, one was short for the other. The translation in world terms would be how much one would build if there were no factories. This would go down with trade, but you probably get more with trade, so trade would be more significant than production taking a economic hit if you didn't have factories. While one would loose manufacturing, or production the other would loose money. This could do this to both if they both had resources or factories, but this could also be affected by how much one factory employee makes. Making the one with the lowest standard of living the winner, unless; the other guy had tarrifs. In game terms factories manufacturing is times Production I do agree that power plants should be base manufacturing since they would affect many things not just one building Ie duranthium refinery. In the real world a industrialised nation is about forty times a unindustrialized nation. forty times translate to 4000% more production from factories. I guess to be affective the factory value would have to change depending on the map size, and rarity of options to keep this value from being overpowered on the largest map. This would require a estimate based on what the average player builds in factories. Also if you capped the total manufacturing level at 4000% then it would be realistic warning the players when they hit the limit, so they wouldn't waste space on things that wouldn't help them in any way. Also all rush building, or buying should do is add production to what you are building while taking a realistic economic hit. Only adding production to what you are doing this to not everything. Again this still would be based on a number of no more that three times. Unless you took a trade hit from this. The game conflates a couple of words and should be more careful. 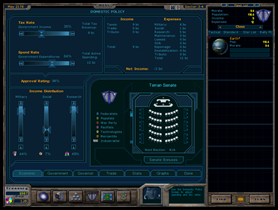 "Raw Production" is the technical name for production based on population, asteroid mines, etc, with bonuses applied. That gets divided up into the three categories, Wealth , Research, Manufacturing. Each of those have their own bonuses and multipliers. The Manufacturing gets further split in Social and Military and they can have their own bonuses. As far as I am concerned, those should be the only words used in the descriptions and dialogue. It should be as strictly enforced in text as value names are strictly defined in code, the same string every time. At times, the game will use "production" or "productivity" in a more colloquial sense, especially in flavor text. There, it most often seems to mean the total Manufacturing amount or a multiplier applied to the base Manufacturing. If it is in the bonus description, it usually means a bonus applied to the base Manufacturing. Sometimes, it seems to refer vaguely to the total of all categories with all their bonuses as the "productivity" of that planet. I find that a valid concept, but a poor word choice. On the whole, I trust them when they say "raw production". Otherwise, it doesn't feel consistent, and I kinda have to remember case by case what they really mean. It annoys the wordsmith in me, but it is hard enough to get typos corrected, let alone getting vocabulary usage polished to my nitpicky standards. Worker is a poor name for a super ability. It should be changed to perhaps Production Manager, or if limited to one word, just Manager, or even Foreman is better than Worker. Make the manu citizen a robber baron. A thought occurred to me. What happens to a citizen that is on a colony that gets culture flipped or invaded?